If it wasn’t for Ed Roberts, who died today aged 68, blogs probably wouldn’t exist. After selling electronics kits to model rocket builders, Ed went on to design and build the Altair 8800 for MITS, a company based in his garage. 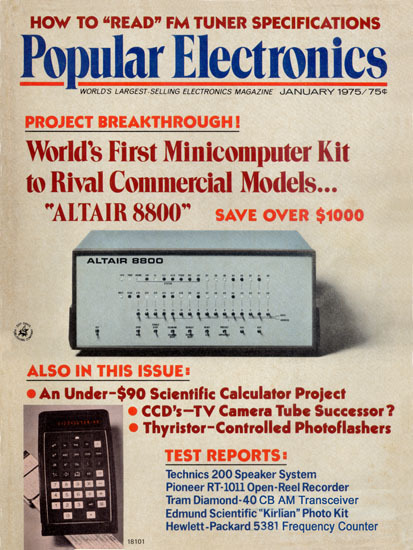 The 8800 was promoted on the front page of the January 1975 issue of Popular Electronics as the “World’s first minicomputer kit to rival commercial models”. The young Bill Gates and Paul Allen read the magazine and contacted Roberts with an offer to write software for his machine. When he accepted, they moved to Albuquerque, where MITS was located, and founded a company known as Micro-Soft. Personal computing was born, and Ed Roberts is widely hailed as its father. It wasn’t supposed to be like that. You may have seen some variant of the forecast attributed to IBM founder Thomas Watson that the global market for computers could reach five or six. And the history of technology is full of stories of predictions that turned out to be hilariously, or tragically, wrong. There are two basic mistakes. The first is to imagine that the future is simply an extrapolation of the present. OECD Insights: International Trade tells how in the early 1980s, AT&T hired the consultancy firm McKinsey to study cellular telephony. McKinsey estimated that by the year 2000, there could be 900 000 cell phones worldwide. Today, twice that many handsets are sold in a week. McKinsey would have been right if phones and services had stayed much as they were at the time. In 1985, a mobile phone weighed 20kg and in the UK it cost the equivalent of 320 Euros at today’s prices to rent for three months. The second mistake is to fail to see potential connections. Telephony and computing had been around for a long time before they got together to make the Internet. In these cases we’re talking about technology, where companies are actively seeking to transform ideas into profits. In science, the issues are a bit different, but some of the poor thinking underlying technology forecasts is often at work. Scientific research is routinely accused of being a waste of money. Partly, this is due to media stories like the formula for a perfect wife. At a more fundamental level, though, many people, including politicians who decide on R&D budgets, don’t understand how science works. Often, we hear that it should be “useful”. But how do you know in advance where research might lead and what its uses could be? Take ornithology. You could make a convincing case that bird watching is a fascinating hobby, but governments shouldn’t be paying people to do it. It doesn’t have much economic value, except as a minor tourist attraction. Then along comes avian influenza, and the possibility that some national poultry industries could be wiped out, or that the virus could even mutate and infect humans. Suddenly, migration patterns, nesting habits and the like become vital pieces of information. The same is true about another piece of news that hit the headlines this week. Researchers working in Italy discovered that toads may predict earthquakes. The scientists were studying breeding behaviour. They weren’t looking for anything remotely to do with seismology, but the finding could turn out to be a “useful” contribution to predicting Earth tremors. One of the most positive aspects of globalisation is that connections that once would have been impractical or unimaginable are commonplace. Not just goods, but ideas and knowledge flow quickly around the world and we’re no longer surprised by Japanese whisky or Texan basmati rice or Iranian Lacanians. But we would be surprised if we knew what new combinations the future has in store.